Cooked salmon with salad and lemon and lime wedges. Cook salmon under the broiler for a quick, simple and healthy preparation. 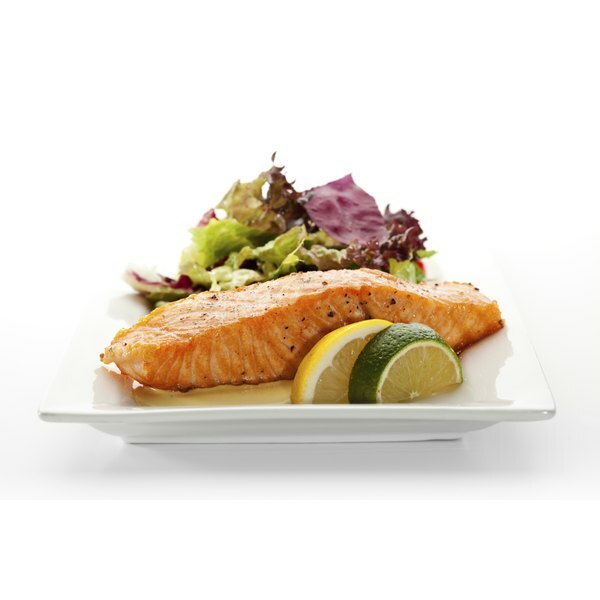 Low in calories, with a mild taste, broiled salmon requires no additional seasoning. Add a marinade, glaze or just a few seasonings to the fish for more flavor. Broiling ensures that the fish will be moist inside and crisp on the outside, similar to the results you achieve from grilling. Move the rack in your oven to between 4 and 6 inches away from the broiling heat source. Turn the oven's heat setting to "broil." Place a layer of aluminum foil on a rimmed baking sheet. Pat the salmon fillet dry with a paper towel. Place a knife flat against the top of the fillet. Press down and slowly move it down the length of the fish to expose any bones. Pull any bones from the fillet with a pair of needlenose pliers. Set the salmon fillet on top of the foil. Place the baking sheet in the oven. Cook the salmon fillet for between six and 10 minutes, checking the fish after five minutes and then every couple of minutes after that. The salmon is done when it changes from a translucent pink to an opaque color. The salmon should flake easily when cooked through; poke the tines of the fork into the flesh to test. For additional flavor, marinate the salmon for 15 minutes in a mixture of soy sauce, rice vinegar, honey and ginger. Make a glaze of white wine, Dijon mustard, thyme and rosemary. Coat the salmon with the glaze during the last five minutes of cooking. Simply flavor the salmon with salt and pepper, if you prefer.